For those of you who celebrated Mother's Day on Sunday, I hope you had a wonderful day! Huge hugs to you if the day is a sad one. I also want to say my heart goes out to all the families whose lives have been impacted by the ferocious wildfire happening in Alberta, Canada. I'm sure I've told you before that one of my card artist heroes is Kay Miller. Her blog is My Joyful Moments. I mean, first of all, what a great and befitting blog name! I can tell you I've had a mazillion joyful moments drooling scrolling through Kay's blog! If you live in the shady side of the forest and haven't yet had the pleasure, take a day and visit her to see for yourself. You might want to wire your jaw shut first. So it was beciting for me to see that sweet Kay is the featured card artist to be CASEd over at the "CASE with a twist" challenge at Time Out. I couldn't pass that up! When I CASE (copy and share everything) someone's card, I call it DJKASE because I like to mess with letters and words and aaackronyms. And it confuses new readers. Wait. What? Cards in Envy: Just Us Girls: cards for girls or ladies. 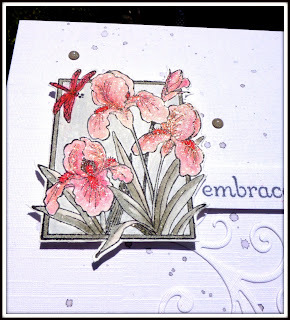 STAMPlorations Theme and Sketch: Stamp and anything goes. Sweet Stampin' Challenge: May flowers. 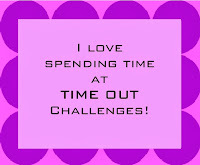 TIME OUT Challenge: CASEing Kay. Being goofy after their baths. 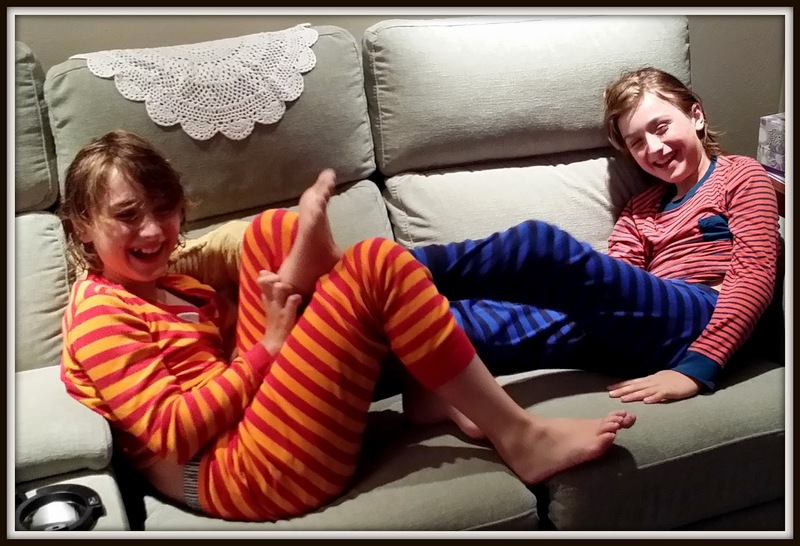 They are going to be tall men; it wasn't that long ago they both easily fit onto just one cushion! Don't mention it to them, but I'm still jealous of those eyelashes! And this one looks like a good one for the Christmas card photo, doesn't it? Henry is on the left and Adam is on the right in all the photos. How does that happen? Archana Bhurke (Ranjan) of Handmade Cards by Archana. Archana is originally from Mumbai and now lives in Germany. 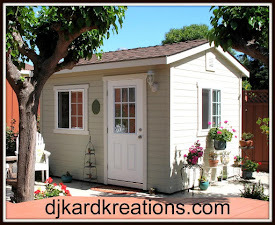 She started blogging in 2011 and has become a well-known and talented artist in Blogland. She is a frequent challenge award winner and a Girl Friday at Casual Friday Stamps. After trying her hand at jewelry making, painting, and sketching, Archana says that creating card art is the most satisfying of any hobby she has tried! Deepti Aggarwal of Vishesh Collections - Handmade by Deepti. Deepti is originally from Bangalore and she now resides in the United Kingdom. She started blogging in 2010 and after taking a little hiatus the last few years, she is back to being very creative this year. You may have seen her in the winning galleries of some of your favorite challenges! Lilian YF of The Leaf Studio. I'm sure Lilian needs no introduction to most of you as she has been blogging since 2007!! Lilian also loves photography, which she has been enjoying since 2000. She started working with paper craft in 2004. I am in awe of those statistics and of her beautiful and consistent card art! You will find buckets of amazing inspiration when you visit her blog! Carrie Sheridan of Carrie's Custom Cards. Carrie just started blogging in 2015. She is the mother of four who loves making cards when she is not tutoring online in French and English or busy with her church. 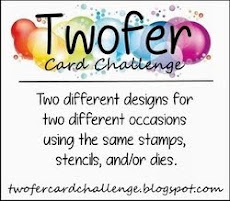 Carrie has become a frequent challenge winner with her beautifully designed and uplifting cards! Susan Renshaw of Calling All Crafters. Susan has been blogging since 2013. She serves on design teams and excels at challenges throughout Blogland. Susan's card designs are always so unique and creative. 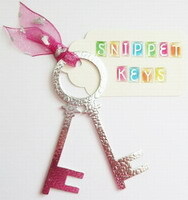 You'll also be charmed by her talent in scrapbooking and journaling! Thank you for joining, ladies, and welcome to the Playhouse! Click Comments and a pop-up box opens. Click "Jump to Comment Form" and walla, no more car pool tunnel! Oh my word! I thought the original was fabulous when I saw it - but wow, wow, wow - yours is even more so! I love your grey and pink irises! A beautiful card Darnell - such lovely colours and a fabulous image too. Lovely photos of the boys too! Those boys are going to break some hearts. Love your CASE Darnell, that stamp is so pretty! Love the gorgeous pictures of your grandsons! They are so handsome...and they are definitely sprouting up! Your case of Kay's card is amazing. The soft texture is absolutely fabulous! I'm with you on being a huge Kay fan! Thanks so much for playing along with us at Time Out! Your card is flippin gorgeous! Hope you had a wonderful Mother's Day. All three cards are fantastic! I adore Kay and your take on her card is a pure delight. Love how you said Stella wanted to play. :D Your grandsons' cards are so sweet. You are training them up right, that is for sure. Great photos. They are handsome young men, with lots of glorious hair! Thanks so much for sharing, Darnell. Have a fabulous week. Love your DJKASE. The flowers are beautiful. What fun to share your crafting with the grands. Cute boys. Love your DJKASEing card and how you had the flower panel pop up above the embossed background. Great technique that I will try soon! Thanks for sharing! your card is wonderful Darnell - looks like a winner to me - love the color of those iris! Wow, this is gorgeous, Darnell! Great coloring and I love the flourish. Great family pics too, thanks for sharing! Wowser Darnell - that's one stunning card! Great CASE and just perfection! Your card is gorgeous! And loving the photos of the boys! That is funny they always end up on the same side! HA! Well done Darnell! You've captured the tulips I had in my Denver garden! Good looking boys who'll be heart-throb handsome men. Why guys always get the long lucious lashes?! Have a wonderful week. Your card is simply gorgeous! Beautiful job of CASeing Kay. Beautiful CASe! I love the stamp you used and how you cut around the edges....very creative! Gorgeous take on a gorgeous card. Elegentamente! That's Spanish for awesome sauce I'm sure. And whoa.... them grand kiddos have gotten large! That has got to the world's best CASE, because your version is even MORE beautiful than the original, wow! The pink and gray irises are elegant and striking. My favorite flower happens to be the iris so I was drawn to it immediately but your creative coloring takes this card over the top. Looks like your weekend with the twins got your mojo back in gear big-time!! Absolutely FABULOUS, Darnell!! Kay is the best! And you are right behind her with your creativity!! Absolutely nailed the CASE card...fabulous! Love seeing the pictures of the boys!! they are two good looking kiddos!! You are a blessed grandma! Thanks for sharing Joy's card and your CASE of it. I love both versions. And, I also loved to see your Mother's Day cards too. The grandkids are very good looking and I loved the photos you shared. I am sure it was a fun time for all of you! Hello Darnell, your card is stunning, such a beautiful floral image with lovely colours. The DJKASE of Kay's card is so beautifully colored...pink and grey irises really do it for me. I, too, drooled over Kay's card for a long time before I did anything about it. As it turns out, I practically copied it (boo, me!). Think the twins legs look a good deal longer than the last photos I saw of them. 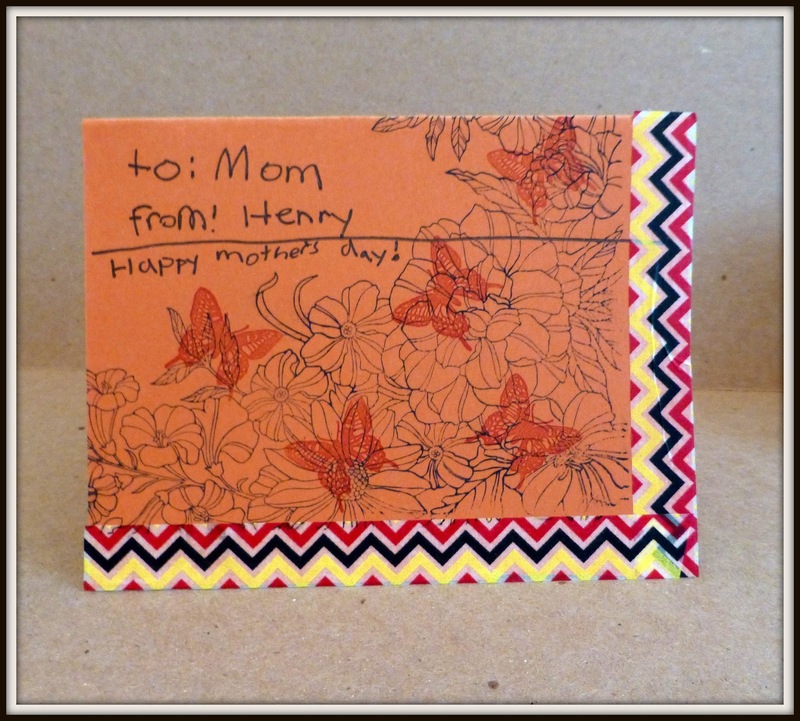 They did a stellar job on the cards for their Mom. Hope your Mother's Day was memorable & you're feeling better. Think of you often. Your card is beautiful Darnell, I love the pretty pink irises and the curly flourish.A super DKCASE of Kays lovely card. WOW! Your card is absolutely BEAUTIFUL!!! Love the card that you cased and love your case on the card. Fabulous photo's of your Twinies. Love all your cards! The one for our challenge is stunning! Love it! Thanks for sharing it with us at Cards in Envy. Wow, your card is gorgeous Darnell. I like the original but love yours even more. Great job my friend. Fabulous case, and I love that you kept the flourish! Your twins are talented boys. Just like their grandma. They have created super nice and sweet cards. Thank you for sharing sweet photos. AMAZING CASE of Kay's card Dolly!! LOVE that gorgeous image and your colouring is awesome. Love the pink and gray with the shimmer. Geeze woman! You have too many commenters - my scrolling finger is sore!!!!! Lol.... Back fro holidays I am & lovely to see you case-ing as beautifully as ever. I've got my eye on a Wink or two... Don't have any ATM & they look so winkin' pretty ..... As do your grand twins - but don't tell them that!!!!! Wow, your case is lovely. The colors are so pretty and I do like the frame around the flowers. Thanks for sharing the pictures of the twins. They are growing up so fast and are so darn cute. I hope you are still feeling better and that you had a great weekend with the boys and a fun Mother's Day. I love pink irises and if gray stems and leaves hold them up, I'm all for them! LOL, I love artistic license and use it often. Love that pretty flourish too! A great design! I'm glad you had a great Mother's Day gift of time with those 2 handsome boys! We'll be celebrating this weekend with our crew. Can't wait! WoW! I thought Kay's card was super and then yours came along! 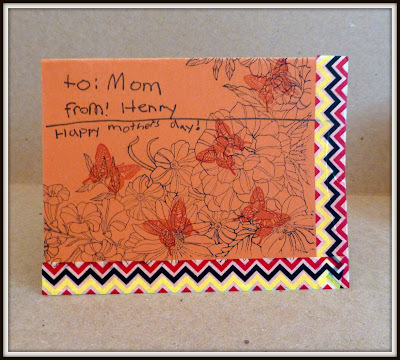 Your stamps, color choices and design is a perfect casing of her card! Your twins are good sports letting you capture so many pics of their visit too. Beautiful card...really love your take on Kay's card, just gorgeous my dear friend! I love all your sweet photos too! Hope you had a wonderful Mother's Day! Your CASE of Kay's card is beautiful Darnell, love it!! The boys are so cute and growing up way too fast!! What a masterpiece your DJKase is - I think it is better than the original, if you don't mind me saying so!! Love it. Your twins are growing like mushrooms - and yes, I know what you mean about young boys and their eyelashes!! Beautiful DJKASE on a beautiful subject card! Who wouldn't just love pink and gray irises? Wow, the boys sure are getting big! Happy day with them, I'll bet! Oh how very pretty...love the softness of it and you have 'cased' it perfectly...how fun!! 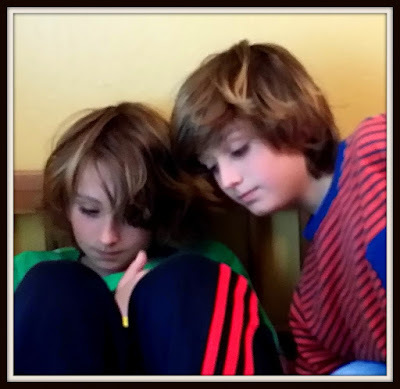 Great pics of the grandsons, too...wow they sure are growing up fast!! Darnell, your card is a stunner, as always! The boys' cards are great too and so good to see them. Darnell your case of Kay's card is simply elegant and you should feel very proud. The twins cards for their mother are delightful. Hope you are feeling well and that you had a marvelous time over Mother's Day. By now I have seen so many beautiful CASEs of Kay's card, but your beats them all - truly outstanding! Wow - such an eye-candy! Hey sis,beautiful cards.Just wanted to let you know that I think the boys are very handsome and you're right, they're going to be a couple of very tall drinks of water. It was so nice chatting with you today. I love you. I love Kay's card and CASEd it myself (as you will soon see) but your take on it has just blown me away! That stamp is so beautiful and perfect for it and you colored it expertly! Together with the white swirl and the splatters it is a true gem! Wow, those boys have grown (and I know they are not done yet)! Love their sweet cards! Your CASE'd card is wonderful, and I love the colors used on your flowers. Good to see this use of your artistic license. 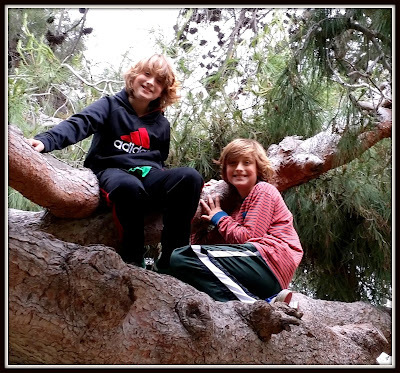 :) Thanks, too, for sharing some fun photos of your grandsons. FANTASTIC CASE of the other card Darnell. Very pretty indeed, and very inkspiring. Delightful CASE and delightful eyelashes. I love Kay's work too! You CASed her card beautifully Darnell! Your cute Grandsons did a great job with theirs too ... What a talented family! Just as beautiful here as on FB Darnell, an amazing take on Kay's gorgeous card. Love the boys cards too, it obviously runs in the family, great pics of the boys looking very as we might say, gangly (tall and slim) and also quite handsome, gonna be heartbreakers for sure !! What a stunning amalgamation of softness! From the airy pink to the artful splatters, this one is a real winner! It's so fun to see what the grandkiddos are doing. :) Thank you thank you thank you for linking up your lovely creation with the STAMPlorations challenge. Your pink Irisses and the grey leaves are so pretty and your DJKASE of Kay's card is fabulous!!!! 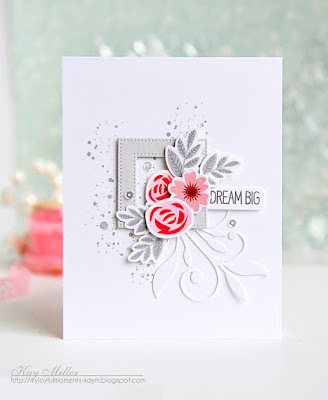 I've got that flourish die from MFT and I love it - you have used it so beautifully here!!!! Such a lovely card!!!! Thanks for sharing the boys' cards - their mom must have been so happy on receiving these special cards - both are just gorgeous!!! They are such handsome little guys!!! TFS the photo's!!! o wow, the card and your CASE are so beautiful and elegant. I love the photos of the boys, they are so sweet and their cards are really original. Well... You sure rocked this one, Darnell. What a fabulous CASE of your friends beautiful card and what handsome grandsons! 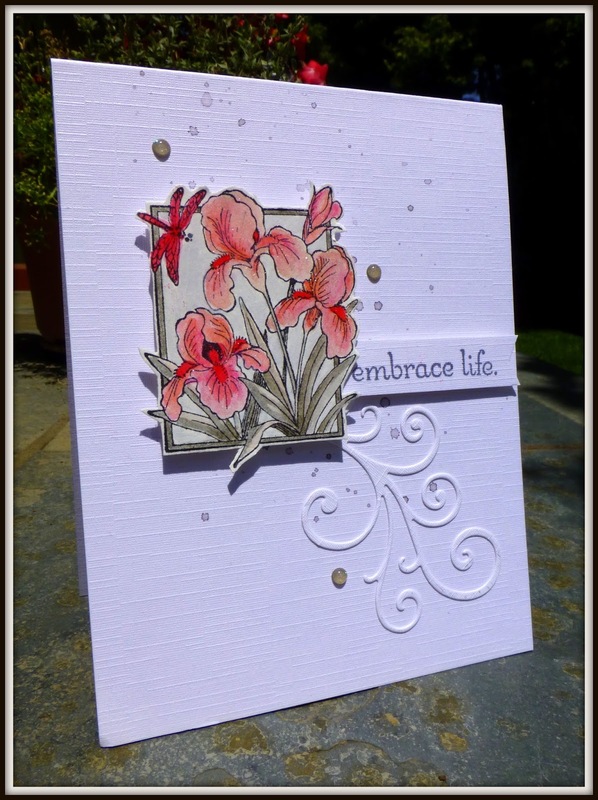 I have to admit that I drool over Kay's blog, too...and your take on her card is absolutely GORGEOUS, Darnell! 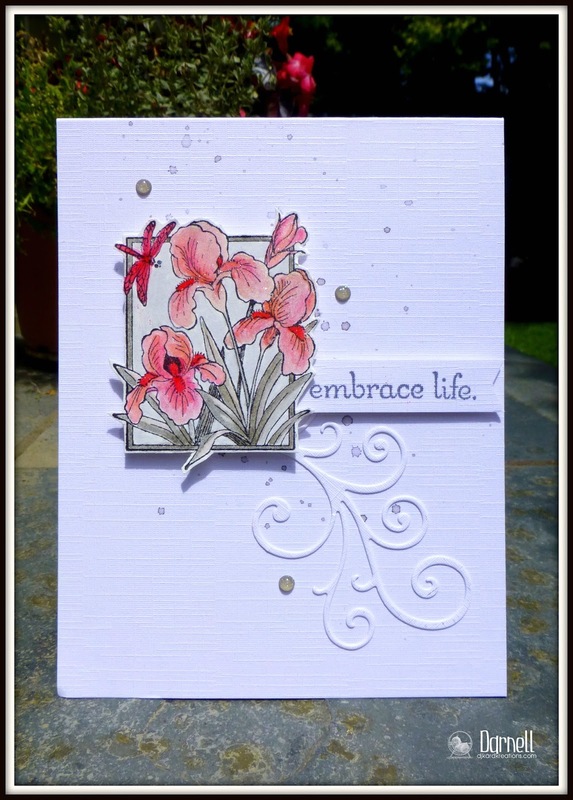 Love how you colored the blooms and dragonfly, and your flourish is to 'die for'! WOW! Thanks for sharing pics of those beautiful young men you have there! They're growing too fast, for sure ~ How sweet that they spent the weekend with you...their Mother's Day cards are really fabulous! Love the card you created. SHHH!! I like it better than the card you cased. Beautiful. The twins are good looking boys. Mom is going to have her hands full. Chuckle. Wonderful CASE of Kay's card. Love those pretty flowers. And, what handsome grandsons you have, and they are talented card makers as well. Thanks so much for playing along at Time Out. Love your pretty pink & sparkly irises Darnell! A lovely CASE of Kay's card. Your grandsons are good looking boys who not only have gorgeous eyelashes but also that gorgeous hair! Hmm... I have a feeling I already commented on this pretty card... But I'm not sure and another comment doesn't hurt! : )Thanks for taking TIME OUT and joining our challenge! 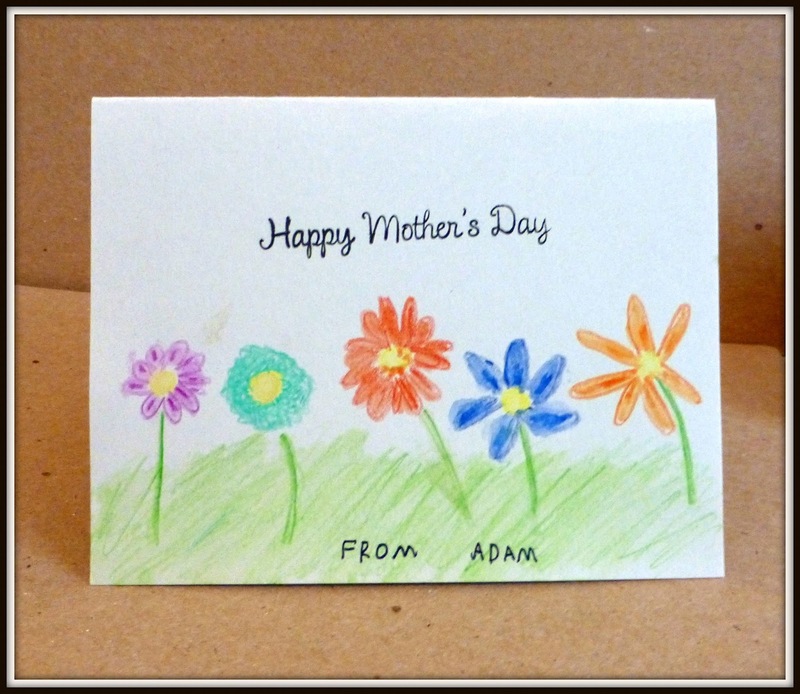 The coloring of your flower looks gorgeous and what a pretty stamp that is, perfect for clean cards like this one. Great job. You're an expert with those Ziggies, Darnell. The coloring is wonderful and I have seen irises in various colors, artistic license or not. The entire card is a beautiful DJKASE. Speaking of beautiful, oops I mean handsome, those boys are. And talented, too. It must be fun to share the playhouse with them. Super card. The original card was lovely, but I love yours too! What a perfect CASE and a real beauty! 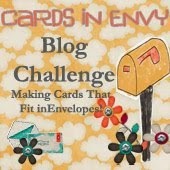 Thanks for playing along over at Cards in Envy and sharing the handsome pics of those grandsons! Beautiful cards by all of you. Those boys are certainly growing up. I'm envious of my grandsons eyelashes too. Your grandsons are going to be tall and very popular, they are two handsome boys! WOW,,SUPER DUPER post! Your CASE of Kay is totally amazing blows me away!!! 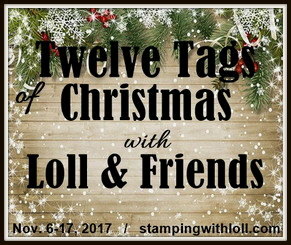 And I have to join you on the Tag you are it challenge !!! This is a great card. I love Kay's designs and you did a fabulous job. I think your CASE is my favorite of all I've seen, Darnell--just gorgeous! So glad you got to enjoy time with the boys who are just too cute & growing up so fast! Isn't it amazing how something so similar can look so totally different!? Beauties, both of them! Gorgeous CASE of Kay's card, Darnell! Love that you have it down to the colors, splatters, flourish, and sentiment placement -- very similar and yet different still! Oh your CASE of Kays card is STUNNING!! I LOVE the shiny on it!! The way you placed the flourish rocks and the colors are divine. I also love the cards your grand kids made too. So fun that they like to play cards with you!! Very gorgeous flower card. Thanks for sharing at STAMPlorations.